Although permitting challenges delayed the installation of three fish screen projects, FWA along with our screening partners, installed the first screen under the Program that is within the legal Delta. The Sanchez Farms fish screen project, located off of Grand Island on Steamboat Slough, was completed in November of last year. 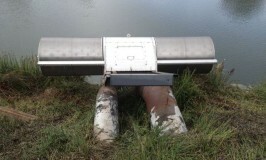 This small 25 cfs siphon diversion was screened with an ISI cylindrical fish screen which will be thoroughly brush-cleaned using an integrated propeller drive system. When water flows into the screen unit, a propeller turns and rotates a gear reducer unit drive system. This drive unit slowly rotates the screen cylinder, causing its surface to pass by, and be in contact with a stationary (and adjustable) brush bar mounted parallel to the screen surface. The inside of the screen will also be cleaned when it rotates about an internal brush system. The intake flow rate needs to be about 6 cfs before the screen cylinder starts to rotate and self clean. The entire propeller drive unit is sealed. Sanchez Farms produces approximately 500 acres of various crops, such as asparagus, corn, alfalfa and pears. It is amazing the diversity of agriculture products that are grown in this critical area of t he Delta. The Alamo Farms fish screen system was also installed in November. Located in Colusa County on the Sacramento River, this 36 cfs diversion was screened with a cylindrical fish screen utilizing a traditional hydraulic self-cleaning system. Alamo Farms produces over 850 acres of alfalfa, rice, wheat and corn on the west side of the Sacramento River.